General: Toilet compartments shall be Type PL-______ (CS-Ceiling Stile; or FS-Floor Stile; or FF-Full Flush; or FC-Floor to Ceiling) as manufactured by American Sanitary Partition Corporation, Ocoee, FL, 34761. Materials: Panels and doors shall be externally covered with high pressure decorative laminated plastic, all edges bound, the above bonded to industrial grade 45lb. 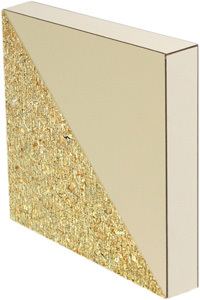 particle board core (plywood core panels and doors available at additional cost). Stiles shall be of veneer steel construction (similar to our Baked Enamel construction) laminated to a honeycomb core and externally covered with high-pressure decorative plastic. Construction consists of NO PARTICLE BOARD. Construction: Stiles, panels and doors shall be laminated to a correct dimension producing a stile unit of not less than 1¼" thick and a panel and door unit of not less than 1" thick. Stiles, panels and door units shall be pre-pierced for application of fittings and hardware. Fittings: All wall brackets shall be "Zamac" cast alloy non-ferrous metal. All brackets are chrome plated and adjustable to keep panels and stiles clear from walls. Stile cover bases shall be 3" high, of No. 304 stainless steel. Finish: Color shall be one color or one combination of two colors selected, but not limited to American Sanitary's standard color chart. Color charts available on request. Hardware: Doors shall be equipped with "Trouble-Proof" hinge set. Each hinge set shall consist of cast non-ferrous metal hinge brackets. All hinge brackets are chrome plated. The top pivot shall be recessed into the edge of the door 2½" below the top. Heavy steel pin operating in a "Zytel" nylon cam which permits setting of the door at any desired position when door is not latched. Slide latch, combination bumper and keepers and coat hooks shall be of cast metal which are chrome plated. All hardware except coat hooks shall be through bolted. One way theft proof screws and fasteners shall be provided for all hardware. Stainless steel hardware available on request.